I haven't been blogging much lately because there are some wild and crazy things happening for our family. If you are interested in reading more, please go to our family blog at: http://bendickson.blogspot.com/. With autumn in the air, here is a simple recipe that is great as an appetizer or a healthy snack! This is one of my favorite appetizers! It’s FESTIVE, FUN, EASY and HEALTHY! Place cashews and sunflower seeds in food processor and grind to a fine meal. Add the salsa and process until the consistency is moist, but stiff enough to spread as paté. Serve with hearty whole grain crackers. Great dip for veggies too! 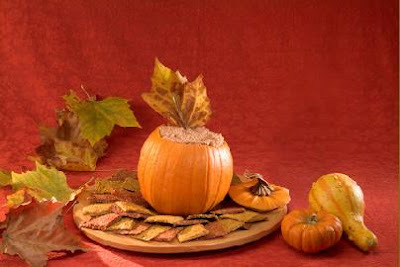 For holiday flair, it's fun to serve the pate inside a scooped-out mini pumpkin lined with wax paper. Pate tastes best when chilled first. Tastes even better the next day, so it is great to make ahead. If stored in the refrigerator in a tightly sealed container, this will keep at least three days.